Joe was hands down our best investment in the whole wedding. We decided right away that photography was the most important item on our vendor list. We figure that after the dinner and cake was eaten, flowers were withered, that we will always still have our photographs from our wedding. 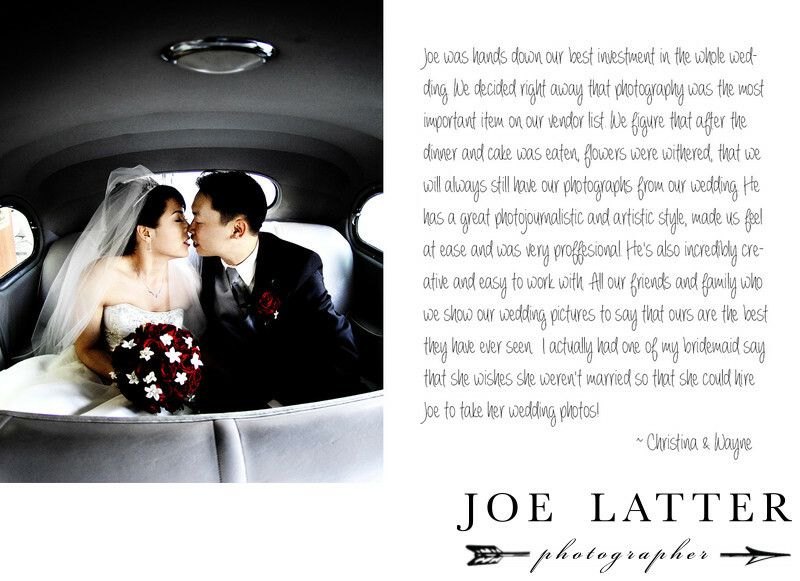 He has a great photojournalistic and artistic style, made us feel at ease and was very proffesional. He's also incredibly creative and easy to work with. All our friends and family who we show our wedding pictures to say that ours are the best they have ever seen. I actually had one of my bridemaid say that she wishes she weren't married so that she could hire Joe to take her wedding photos!